Such deficiencies included seizing, damage or missing cleats, as well as damage or wastage of cleat crutches (saddles) and so on. 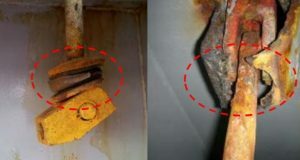 Port State Control inspectors often confirm not only the condition of the hatch cover gaskets, but also the condition of the closing devices. When a defective condition, as seen in the photograph, it should be pointed out as a deficiency. Furthermore, it is entirely possible says ClassNK that such a deficiency might lead to grounds for detention due to a lack of an SMS implementation plan. ClassNK recommends that visual inspection and maintenance of securing devices between hatch covers and coamings, including crutches, should be carried out for all ships at appropriate intervals to ensure there are no potentially serious issues developing.